Are you looking for converting your TAB data file into KML format for using it in your GIS project? Have you extracted and downloaded TAB file from Map Info, MID or MIF and want to render it with your Geo library which support KML format? 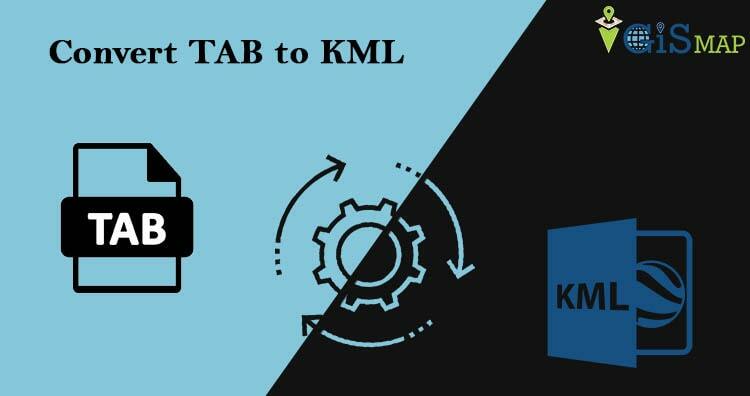 If so, here is an article to convert TAB to KML format using this amazing online conversion tool. You can use any of the tools to convert your TAB data file to any other format available in market, but If you don’t want to spend so much time just on conversions and want an easy way for conversions. Here is an amazing tool for converting your data files within a minute, i.e. IGIS Map Converter. IGIS Map converter is an incredible tool for data file conversions. It will translate an MapInfo file (in TAB format) to a shapefile or KML format. Even it can also convert from KML format to shapefile, or KML to TAB, or Shapefile to DXF. It Convert GIS files online without using complex and Enterprise Software like ArcGIS, QGIS, AutoCAD etc. IGIS Map converter is much easier to use then any other conversion software or tool. Go to http://map.igismap.com/converter/ and you will see the IGIS map converter. Now just drag or upload your TAB file from your system or access the file from Google Drive or Dropbox. Don’t Forget to upload all the related files with it. 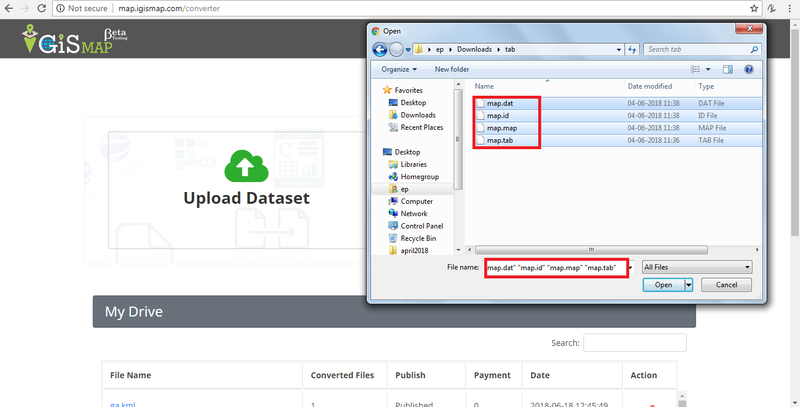 Once the file is upload is completed, select the output file format that we want to convert it into i.e. KML. 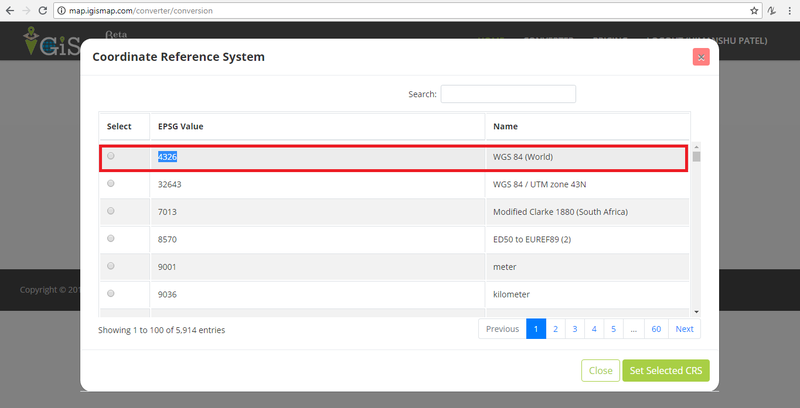 Now for setting up the conversion process we have to set the CRS (Coordinate reference system), as KML converter strictly transforms input dataset to WGS 84 coordinate reference system (if needed). Please make sure that coordinate reference system of your input dataset is assigned correctly – otherwise the resulting KML file may be spatially shifted or wrong. KML converter strictly transforms input dataset to WGS 84 coordinate reference system (if needed). 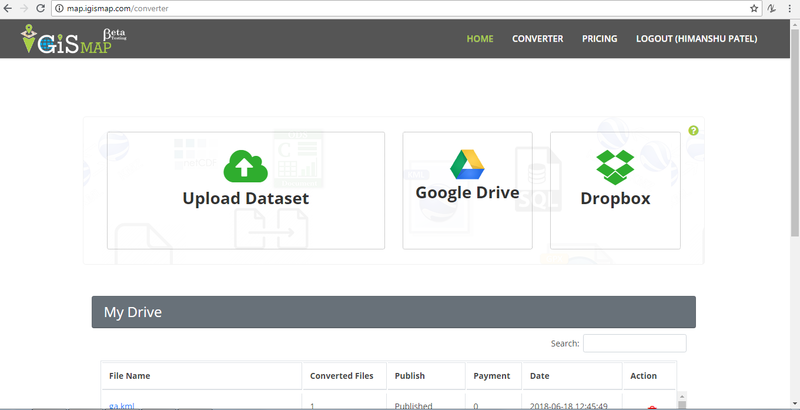 Now click the Convert file button to convert the data file formats And you see a new dashboard with two partition, One for downloading or deleting your new KML file format. and other one which shows the file content area i.e bounding box area of TAB file. You can Download your converted file here or delete it whatever you want, When you scroll down you can see My drive section where all of your converted data files stored. Here you can publish or delete them according to your requirement. Now, you can also publish your KML file as map to see the content in the file or to check the conversion. Info GIS Map supports most of the commonly used GIS or AutoCAD files like Shapefile SHP, KML, KMZ, CSV, TopoJSON, GeoJSON, GML, DXF, GeoTIFF, NetCDF, GRIB, HDF5, OSM, PBF, TAB and many more raster and vector files, along with that it support more than 4000 Coordinate Reference System. 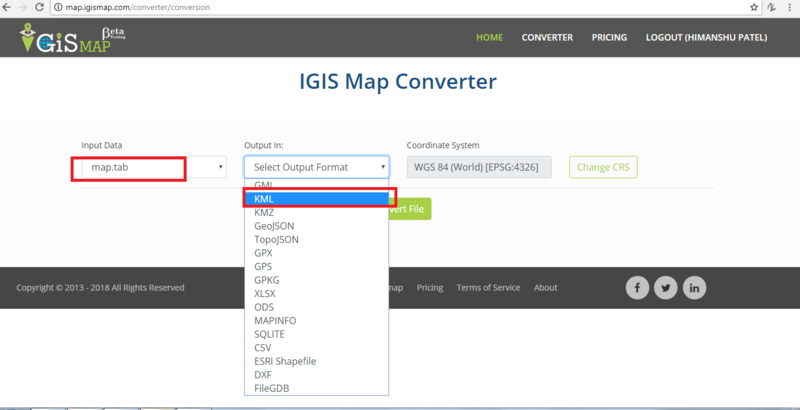 IGIS Map Converter is a online tool for converting GIS data files from one format to another. which helps you in easy data conversion and beautiful and incredible map creation in no time. IGIS Map converter online tool is recommended for better and easy conversions. If you want you can also use ogr2ogr offline conversion tool for convert TAB to KML format.